How to Import Your Projects from Storyline/Invocable into Voice Apps? Quickly import your project in three easy steps! The news that Storyline is changing its business model has left many Storyline users looking for a new home for their skills. If you are one of them, we believe Voice Apps is the perfect home for you! We support nearly all of the features of Storyline in our Free plan, so you can continue to edit and host your skills without additional cost. We have an easy-to-use visual interface so you'll feel right at home. We've made it really easy to export your skills from Storyline and import them into Voice Apps. Your imported skills will be automatically connected to your existing skill in the Amazon Developer portal when you publish them. Voice Apps users have published more skills than any other platform... including Storyline/Invocable. 10% of all Alexa skills worldwide were published with Voice Apps, so you can feel confident that we know what we're doing! 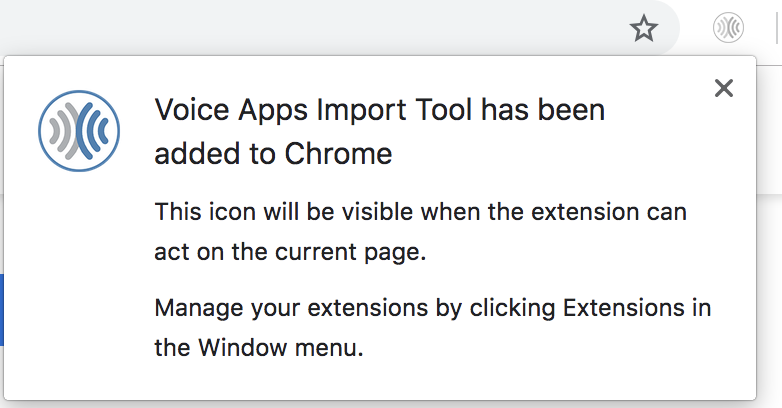 This will bring up the Voice Apps Import Tool page. Click the "Add To Chrome" button and then click "Add Extension". 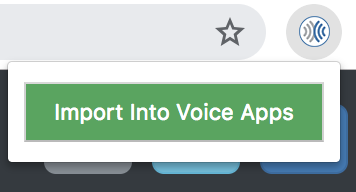 You should now see the Voice Apps icon at the top of your browser in the "Tools" section. Login to Storyline/Invocable and navigate to the project you wish to Export. Click the "Export Storyline Data" button. You should see the page refresh and then you'll be taken to the Voice Apps project page where you should see your imported project in the list of projects at the top. Repeat these steps for any other projects that you wish to import. Voice Apps supports most of the features of Storyline/Invocable, so your projects should import without problems. We still encourage you to test your project thoroughly before publishing as there ARE differences and you may need to "tweak" your imported skill slightly. Q: My project didn't import correctly. What should I do? A: Storyline and Voice Apps work differently, so your imported project may look slightly different than you are used to. Test your project in the Amazon Developer portal or on a real Alexa device to see if it works as you expect. If not, reach out to us and we'll be happy to help! Q: I made edits to my skill outside of Storyline... in the Amazon Developer portal. Is that a problem? A: We can only access the information that is stored with your skill in Storyline/Invocable. We suggest that you go ahead and import your skill into Voice Apps and then add/update any missing information in Voice Apps. Then you can publish your skill from Voice Apps and everything will be in sync.